A Cirebonese Tahu gejrot vendor. The Cirebonese people are an ethnic group centered on the city of Cirebon in the northern part of the island of Java in Indonesia. Numbering approximately 1.9 million, the Cirebonese are mostly Muslim. The language spoken by the Cirebonese is a mixture of Javanese and Sundanese language, with a heavier influence from Javanese. Generally Cirebonese can be considered as an Independent language outside Javanese and Sundanese. 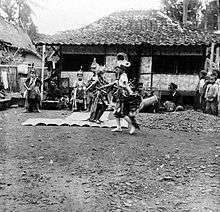 Javanese dance in a backyard in Cirebon. Burokan, a traditional performing arts in Cirebon. In the past, Cirebon language is used in coastal trade in West Java from Cirebon which was one of the major ports, particularly in the 15th century until the 17th century. Cirebon language is influenced by Sundanese culture since the Cirebonese are located adjacent to the Sundanese cultural region; especially Kuningan and Majalengka, and also influenced by Chinese, Arab and European culture. This is evident in words such as "Taocang" (pigtail) which is an uptake of Chinese language (Hokkien language), the word "Bakda" (after) which is from Arabic language, and then the word "Sonder" (without) which is the absorption of European languages (Dutch language). The Cirebon language also maintains ancient forms of the Javanese language such as phrases and pronunciation, for example "Ingsun" (I) and "Sira" (you) are words that are no longer used by the Baku Javanese language. The question about Cirebon language as an independent language from the Sundanese and Javanese language has been a fairly long debate, and has involved political government, cultural and linguistic factors. Studies made by using questionnaires as a benchmark to indicate vocabulary and basic culture (eating, drinking, and so on) based on Guiter's method showed differences in Cirebonese vocabulary with Javanese language in Central Java and Yogyakarta was up to 75 percent, while differences with the Javanese language dialect in East Java was up to 76 percent. Although linguistic research to date suggests that Cirebonese language is "only" a dialect (for according to Guiter's observation, it is said that to be a separate language it must have as much as 80% differences from its closest language), but to date the 5th Regional Regulation of West Java Provincial, 2003 still recognizes Cirebonese as a language of its own and not a dialect. According to the Head of Language Bandung, Muh. Abdul Khak, it is legitimate because the regulation is based on political assessment. In the world of language according to him, a language can be recognized on the basis of three things. First, on the basis of the recognition by its speakers, second on the basis of the political, and the third on the basis of linguistics. Language on the basis of political, other examples can be seen from the history of Indonesian language. Indonesian language which stems out from the Malay language, should be named Indonesian dialect of the Malay language. However, on the basis of political interests, eventually development of the Malay language in the country of Indonesia by the Indonesian government that it was claimed and named as Indonesian language. In addition to political reasons, the recognition of Cirebonese as a language can also be viewed from within its geographical borders. Abdul Khak mentioned that Cirebonese is regarded as a dialect if viewed nationally with the involvement of Javanese language. Which means, when regulations was first made only within the area of West Java, Cirebonese language was not regarded as significant in comparison to the Javanese language. What more if compared with Betawi Malay and Sundanese language, Cirebonese is indeed different. If revision were to be made on the regulations mentioned, there will most likely be a protest from the speakers of the Cirebonese community. Linguistic expert, Chaedar Al Wasilah assessed that with the native speakers being more vocal, changes to the recognition should not be done. Therefore, what is needed is to protect the Cirebonese language from extinction. Most of the original vocabularies of this language have nothing in common with the standard Javanese language (Surakarta-Yogyakarta region) neither morphology nor phonetics. Indeed, the Cirebonese language used in Cirebon and with those in Indramayu, although are part of the Javanese language; have huge differences with the "standard Javanese language", which is the language taught in schools that held to the Solo Javanese language. Thus, before the 1970s, textbooks from Solo can no longer be used because it was too difficult for students (and perhaps also, the teacher). Therefore, in the 1970s, textbooks were replaced with Sundanese textbooks which are considered to be easier to understand because speakers of Sundanese language are "closer". However, it turns out that the idea was a misconception (of the Cirebonese language) until movement was emerged to replace the textbook in the language used in the region, namely Cirebonese dialect of the Javanese language. Nevertheless, publishers that supported of regional language to be taught in schools did not include the word "Javanese language of the Cirebonese dialect" again in the following year, but instead used the word "Cirebonese language". It has also been done on published books by supporters of Cirebonese language as a teaching subject in 2001 and 2002. "Cirebonese Language Dictionary" written by the late Sudjana had not put words "Javanese language of Cirebonese dialect" but only "Cirebonese Language Dictionary". So it was with the publishing of "Wyakarana - Cirebonese Grammar" in 2002 which no longer shows the existence of Cirebonese language as part of the Javanese language, but instead as an independent language itself. Following is a comparison between Cirebonese language with other languages that are considered cognate, such as Serang Javanese language (Bantenese), Tegal and Pemalangan dialect of the Javanese language, as well as Baku Javanese language (Surakarta-Yogyakarta dialect) of the Bagongan (vernacular) style. According to Mr. Nurdin M. Noer, chairman of the Institute of Cirebonese Language and Literature there are at least a few Cirebonese dialects, some which are Cirebonese Dermayon dialect or also known as Indramayuan dialect, Cirebonese Jawareh dialect (Sawareh Javanese) or Javanese Separuh dialect, Cirebonese Plered dialect and Gegesik dialect (northern region of West Cirebon; today it is divided into Kedawung and Tengah Tani districts). The Jawareh dialect or also referred to as Sawareh (meaning "partial", or literally "half") Javanese is a dialect of the Cirebonese language that is used around the borders of Cirebon Regency and Brebes Regency, or around the borders of Majalengka Regency and Kuningan Regency. The Jawareh dialect is a combination of part Javanese language and part Sundanese language. The Cirebonese Dermayon dialect is widely used in the area of Indramayu Regency, according to the Guiter's method, the Dermayon dialect have about 30% differences with the Cirebonese language itself. The main characteristic of Dermayon dialect speakers is to use the word "Reang" as a term for the word "I" instead of using the word "Isun" as those used by Cirebonese language speakers. The Cirebonese Plered dialect that is used in the west side of Cirebon Regency, is known its strong use of "O" characteristic. For example, in standard Cirebonese language the word "Sira" in western Cirebon Regency dialect is translated as "Siro", which means "You". The word "Apa" in Cirebonese language becomes "Apo" (means, "What") in western Cirebonese dialect, likewise the word "Jendela" becomes "Jendelo" (means, "Window"). For instance, "anak saya masuk teka" will be translated as "anak kita manjing ning teko". Besides that Cirebonese Plered dialect has its own unique accent such as the usage of additional words like "jeh" or "tah" in any conversation. Dialect speakers who occupies the western region of Cirebon Regency tend to express themselves with the title "Wong Cirebon", which is very much different from the standard Cirebonese language (Sira) used by the residents of Cirebon city to refer to themselves as "Tiyang Grage"; although both "Wong Cirebon" and "Tiyang Grage" have the same meaning that is "Cirebonese". Gegesik dialect is a dialect that is spoken in the northern region of West Cirebon and around Gegesik district, the Cirebonese Gegesik dialect is often used as the intermediary language in Pewayangan from Cirebon by the Dalang (puppet master) himself and there is a possibility that this is a finer dialect compared to the dialect of the "Wong Cirebon" itself. Lagi apa? (vernacular) Lagi apa? Lagi apo? Lagi apa? Sedang apa? What's up? / What are you up to? The Royal Wedding custom of the Cirebonese community is called Pelakrama Ageng in Cirebonese language. The customs of marriage attempts to elevate local traditions with the emphasis on Islam as the center of the ceremony. The customs of Cirebonese wedding has its own local moral values in the context of the simplicity in the Cirebonese community way of carrying out large celebrations. Such example is in the Cirebonese dowry customs which only requires tubers, vegetables and valuables (as in the form of jewelry or cash according to the groom's means), where in carrying out those requirements Cirebonese community will prioritize Islamic elements more than others; and among them is to avoid ria (the attitude of wanting to be praised). A marriage proposal or in Cirebonese language tetali or njegog is the early stage of the Cirebonese Royal Wedding procession whereby the messenger of the man visits the parents of the woman's house and expressed his intention to marry their daughter. Then the woman's mother would ask her for her approval. The woman will then give her answer in the presence of the messenger as a witness. After receiving the answer, the messenger and the woman's parents will have a discussion to determine the wedding date. Once there is agreement, the messenger excuse himself to convey the message to the man's parents. Mas picis bearers, which are dowries in a form of jewelries and cash that are to be handed over to the woman's parents. According to Sultan Sepuh XIV Pangeran Raja Adipati Arief Natadiningrat, Siraman (meaning, "splashing of water" or "washing" and sometimes also referred to as Siram Tawandari) symbolizes purity. The Siraman procession is a tradition of bathing the bride with a certain traditional procedure takes place before proceeding with the solemnization ceremony. It aims to cleanse the body and soul of the bride before conducting the ceremony, which is the door to starting a new life with her partner. Both the bride and groom will be brought to the place for Siraman, called cungkup by the makeup person, accompanied by their parents and elders. As they walk towards the place for Siraman accompanied with traditional musical instruments; the nablong, the bride will wear a batik sarong of Cirebonese style, namely the Wadasan cloth. Usually the color of the sarong is green which symbolizes fertility. Before Siraman, the chest and back of the bride will be given scrubs and after which the makeup person will then invite the parents and elders to wash the bride alternately. Once completed, the water that is used to wash the bride will be given to young girls and boys who were present as a symbolic meaning that they should follow the examples of the bride and groom. This ceremony is called Bendrong Sirat where the water used for the Siraman are sprinkled to the young girls and boys who attended the event. 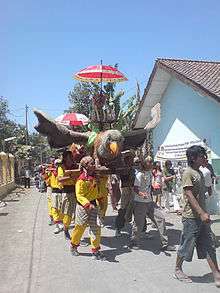 To ornate or in Cirebonese language called Parasan is done by the prospective bride after the Siraman ceremony. One of the Parasan process called ngerik where the removal of fine hair done by the makeup person as the parents and relatives watch. This event accompanied by moblong, a karawitan music which means the fountain of water is like a full moon. Visiting of tomb (ziarah) is normally done to offer prayers for ancestors who have already gone. Usually if the bride is a descendant of the Cirebonese Sultanate, the bride will make a visit to the tomb of Sunan Gunung Jati tomb and the ancestral tomb of the Cirebonese sultans at the Astana Gunung Jati Tomb of the Cirebonese Kings Complex in Astana village, Gunung Jati district, Cirebon Regency to receive blessings before proceeding with the marriage ceremony. Visitation of the Astana Gunung Jati Tomb of the Cirebonese Kings Complex begins by praying in front of the pasujudan gate. The door is the third of the nine doors leading to the tomb of Sunan Gunung Jati that seats at the top of the hill. Apart from praying in front of the pasujudan door, usually Sultan Sepuh of the Kasepuhan palace and the bride will also spread flower petals and offer prayer in the tombs of the elders of Kasepuhan palace; and among them are Sultan Sepuh Raja Sulaiman and Sultan Sepuh PRA Maulana Pakuningrat. The visitation ends at the time for Salat Zuhr prayer. When the wedding day arrives as agreed, representatives of the bride will send emissaries to fetch the groom. Once arrive at the home of the groom's family and the messenger delivers his message with the intention to bring the prospective groom to the bride's home for a wedding ceremony. Parents of the groom are not allowed participate in the marriage ceremony as it is forbidden for them to witness. Once the consent has been granted by the parents of the bride (Ijab Kabul), the groom will be covered with a cloth belonging to the bride's mother. This signifies that the groom has become a son-in-law. After it has been done, the cloth will be taken back to indicate that the bride is no longer in the protection of her parents and now has to carry her own responsibility. Ijab Kabul in Royal Wedding or Pelakrama Ageng of the Cirebonese palace is usually conveyed in loosed Cirebonese language. This event is held as a form of parents expressing their happiness for the marriage of their children. Coins that are mixed with yellow rice and turmeric are spread, or in Cirebonese language it is called Sawer, as a sign so that the bride and groom are given an abundance of fortune, attain mutual respect, live in harmony and are well-suited for each other. Normally when coins are sprinkled or spread, noises of excitement are heard of those that were rushing for the money, yellow rice and turmeric. Those noise of excitement is what is referred to as Surak. ↑ Harthana, Timbuktu & Ignatius Sawabi (2010). "Suku Bangsa Ini Bernama Cirebon". Kompass. Retrieved 2014-12-10. ↑ T. D. Sudjana (2001). Kamus Bahasa Cirebon. Humaniora Utama Press. ISBN 979-9231-38-8. ↑ "Menimbang-nimbang Bahasa Cirebon". Pikiran Rakyat. 2009. 1 2 Amaliya (2010). "Alasan Politiklah Sebabnya". Pikiran Rakyat. Retrieved 2014-12-12. ↑ Ajip Rosidi (2010). "Bahasa Cirebon And Bahasa Indramayu". Pikiran Rakyat. Retrieved 2014-12-12. ↑ Salana (2002). Wyakarana: Tata Bahasa Cirebon. Humaniora Utama Press. ISBN 979-9231-57-4. 1 2 Nieza (2009). Jalan-Jalan Ke Cirebon Sega Jamblang Sampai Batik Trusmian. PT Gramedia Pustaka Utama. ISBN 979-22-4996-6. ↑ Nurdin M. Noer. "Wayang Kulit Di Mata Matthew Isaac Cohen". Pikiran Rakyat. ↑ Lilis Sri Handayani (2013). "Pagi Ini, Putra Mahkota Keraton Kasepuhan Jalani Siraman". Republika Online. Retrieved 2015-01-19. ↑ Roh (2014). "Seusai Siraman Putri Sultan Ziarah ke Astana Gunung Jati". Tribun Jabar. Retrieved 2015-01-19. ↑ Roh (2013). "Usai Siraman, Sultan Sepuh dan Putra Mahkota Berziarah ke Gunung Jati". Tribun Jabar. Retrieved 2015-01-21. ↑ Mik (2014). "Putri Sultan Cirebon Nikahi Pemuda Biasa". JPPN. Retrieved 2015-01-21.